When the young female was first stranded, she was suffering from domoic acid poisoning. She was rescued by the Monterey Bay Aquarium and treated there, then transferred to the Marine Mammal Center. Now she's recovering well there. She just needs a name. It turns out, there are rules for naming a sea otter. Even if a wild animal will be released back to the ocean, it needs a name in the meantime while under the care of humans at the Marine Mammal Center. "It really helps us because just memorizing numbers is very difficult especially when you have hundreds of patients on site at one time,” said veterinarian Abby McClain. Naming a marine mammal is more like naming a Kentucky Derby horse than choosing a name for a family pet. The center isn’t allowed to reuse names — that would violate the terms of the licenses they hold with the U.S. Fish and Wildlife and the National Oceanic Atmospheric Administration which allow them to house and treat wild animals. Be creative. But not too creative. Unlike race horse names, marine mammal names need to be short and sweet. McClain says that’s because the names have to fit on the tiny test tubes that staff use to collect samples of blood and other bodily fluids, to monitor the health of the animals. This particular otter had sky-high levels of domoic acid in her feces when she washed ashore in the Monterey Bay, McClain said. She was having seizures and not responding normally to sound and touch. The aquarium staff had to rehydrate her and feed her a special diet of fish to support her recovery. Traditionally at the MMC, the person who first reports an animal in distress gets to name it. If they don’t want to name the critter, the rescue staff and volunteers get to choose a name. In the case of this particular nameless otter pup, the aquarium didn’t name her. Staff in Monterey reached out to the MMC because otters are social animals and happiest when kept in captivity with other otters. 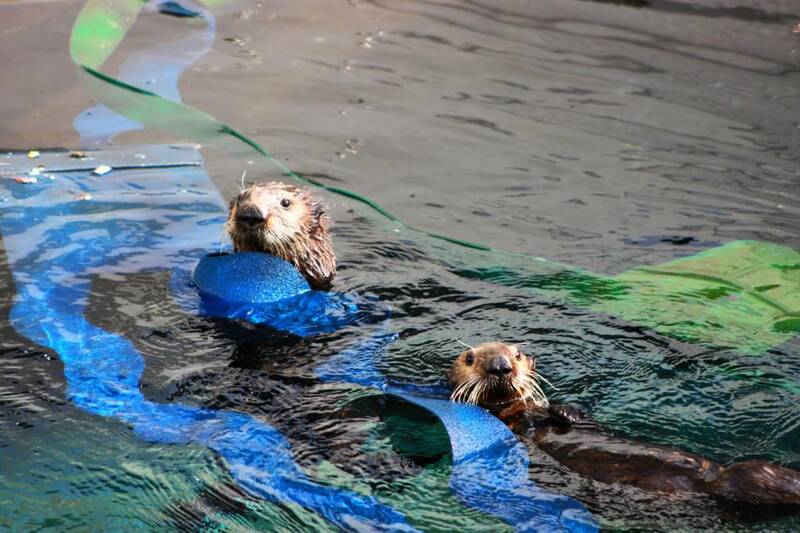 Conveniently, the MMC had another juvenile female otter, so the two became pen-mates. That’s why the nameless otter arrived at the center without a name. The only thing cuter than a baby sea otter is two baby sea otters. This nameless pup from Monterey bonded with the other pup who already has a name: Langly. She has a hard luck story too. MMC staff rescued her and her mother after they had both been attacked by a shark. The mother died but Langly lived. Langly was almost old enough to wean and adapted well to solid food. But at this point in a young otter’s life, they’re not ready to hunt and gather shellfish on their own. In the wild, they’d be hanging out with mother otters and other juveniles, learning from each other how to crack a clam and which crabs are juiciest. Otters are social animals and pairing Langly and the as-yet-unnamed otter is good for them both. McClain said the two pups have bonded, and seem to enjoy each other’s company. She admits she’s partial to “L” names, so the two pups can match. If you’re just dying to contribute Otter McOtterFace to the discussion, too late. Whatever her name is, the pup has already contributed to scientists’ understanding of the effects of domoic acid on otters. They already know a lot about how the neurotoxin affects sea lions. But they’re still learning about how it accumulates in sea otters. 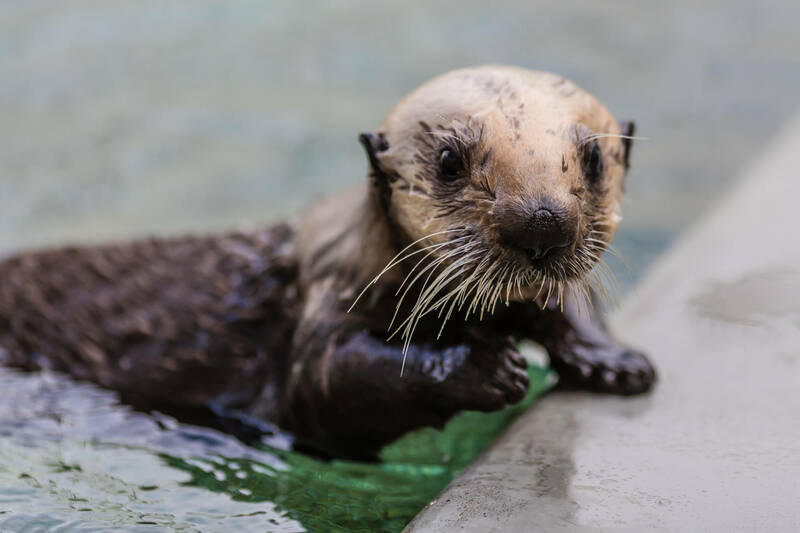 McClain and her colleagues conducted several tests on the pup, which was the first time brain changes have been documented by MRI in sea otters. When the pup is released into the wild, she’ll be fitted with life history tags so marine biologists can continue to gather data. You can vote on the Marine Mammal Center's website until Wednesday night.